My first yoga experience was not unlike the typical first-time yoga student. There I was, in a crowded room, a borrowed mat under me, my body awkwardly searching for the proper position in the poses. From that first awkward yoga experience, however, something sparked within me that I had not felt before, despite my life-long love and commitment to exercise. While inelegantly stretching my body into those first few poses, I experienced a feeling much like being in the bowl of heaven, surrounded by mountains. Beneath me, I felt the earth and the ground of my path. Gazing up I saw the mountain that was mine to climb, my journey. I felt a true coming home within. I felt inspired knowing the pure sense of purpose within my heart. I felt called to spread the healing joy of yoga. One month after my first yoga class, I began teacher training. Within three months I had ten friends practicing yoga in my garage. From the very beginning, I knew the only place that matters in yoga is within. As I embark on my journey of Joyful Breath Yoga, I am truly blessed to have the unconditional love of my beloved husband and soul mate, Tom. He, along with our four children, continues to support me as I spread the joy of yoga. I have the gift of my husband, children and parents as my students. My heart is filled with joy as I watch them embrace their own yoga practice. I have now come full circle, with my studio again in my garage. But now, instead of just a few students in one place, I will have students join me from throughout the world, practicing together, learning the joy of yoga. As we strengthen our bodies together we can receive the graces from God above, we can send out our loving spirit and energy into the world and be the change the world is crying out for! - Journeyed to India to train and study with Yoga Master Dr. Jeyenthi Senthil for two week intensive one-on-one yoga and pranayama/breath work training. -Partner with NFL Chiefs player Branden Albert for community outreach: "Yoga on the Rooftop" and "Yoga for Teen Athletes" at the Zen Zone. -Sponsored Yoga retreat "Journey of Joy - India" - Two week cultural, culinary and yoga retreat visiting the cities of Dehli, Agra, Rishikesh, Rumitek, and Darjaleeng. -Corporate Yoga Trainer for JMA Technologies, International Association of Plastics Distribution, ARMA International. Attended first annual Wake-Up Festival in Estes Park Colorado. Workshops there included Mark Nepo, Rick Hanson, Sandra Ingerman, Adyashanti, Michael Bernard Beckwith, Carolyn Myss, Jack Kornfield, David Whyte. Ashok left a stable job in 2010 to pursue something greater in life. He co-founded and ran a successful Mobile App Development company for three years. Immensely grateful to be combining his App Development skills with the gifts of Yoga, Ashok left the company he co-founded in 2013 to focus more energy into crafting the digital experience for Joyful Breath Yoga. He has been working on many different parts of this project since it was first sparked as an idea in 2012. Two years ago, when Debra was searching for the name of her company, I knew immediately in my heart what it should be. The name had been with her in every class she taught as she guided her students to take a “joyful breath”. 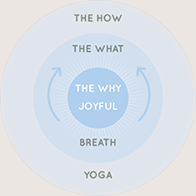 Joyful Breath Yoga was born. Growing up on a farm, I am a hands on man. Working as an engineer also allows me creative mind to work daily. Both of these helped me as I worked to build Debra’s studio in our home. My creative energy was flowing as I began painting, sewing, welding, cutting holes in the ceiling and lighting the studio. Through much trial and error, I found what would create the best visual experience for her students. After losing my father this year, it brings me great joy to know that my Mom can now practice yoga with Debra even though she is two hours away. I love Debra with all my heart and soul and want to help her to live her dream for us and for the world. Chad is the owner of Home Video Studio, a video production and video services company in downtown Lee’s Summit, MO. He is a 50-time Hanley Award winner for Excellence in Video Production. He’s won international awards in several categories including Best Video Production, Best Documentary, Best Editing, Best Sound Design, Best Motion Graphics, and Best in Show. Chad has spent the last 20 years in the audio and video industry in a wide variety of roles: pre-production, script-writing, storyboarding, camera operation, lighting/gaffing, sound recording, sound design, engineering, live direction, audio and video editing, still and motion graphic design, DVD authoring, duplication, media migration, media transfer, and digital media archiving. Cathryn holds tight to the philosophy that people should be themselves fully and un-apologetically. All. Day. Long. I am. It is my desire to bring a fresh perspective to the beautiful people I work with. Telling someone’s story fully and authentically from a unique artistic perspective is truly my passion. I am very blessed for the joy that brings. We are all artists in our own way, moving through life painting the canvas of our world with the colors we choose to write our stories in. Everyone has something to share, a story to tell, and I love the opportunity to deliver the message. I’ve been a professional photographer for the past 3 years and I love every minute of it!